Taunton will be the most northerly appearance made by the Elegance Duo during their October tour. 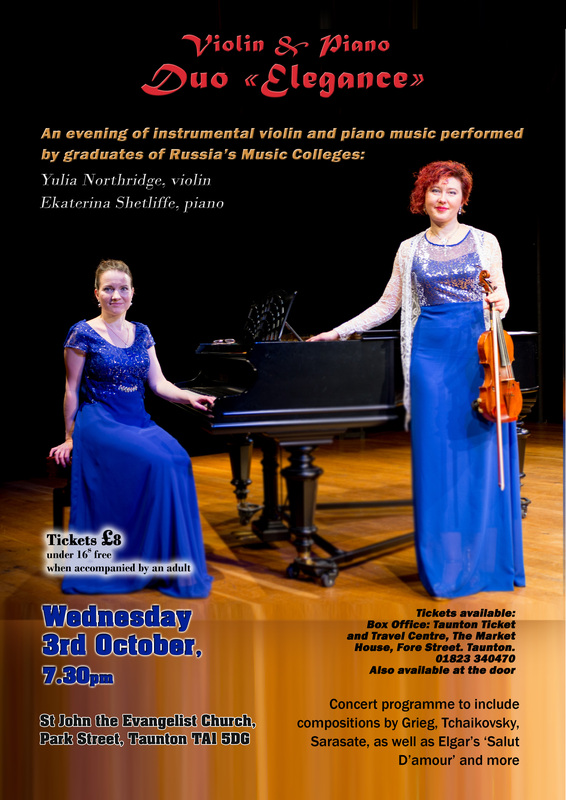 Graduates of the Russian Dargomizsky Music College, pianist Ekaterina Shetliffe and Yulia Northridge will treat their audience to a tour of Europe and a quick trip across the Atlantic as they perform enchanting music such as the much loved Salut d’armour by Elgar and the G major Sonata by Grieg, together with a chance to hear some rarely performed pieces such as the Sarasate Gypsy Airs. There will be something to appeal to everyone so be prepared for a most enjoyable evening.